The film begins in sunny Los Angeles where successful advertising executive David Howard (Brooks) and his wife Linda (Julie Hagerty) are on the verge of relocating to a much bigger and more expensive home, even though they are both secretly dreaming of living a life on the road, a lot like the main characters in one of their all-time favorite films, Easy Rider. So they are visibly tense and occasionally even openly blame each other for not being brave enough to follow their hearts. On the day when David is supposed to get the crucial promotion that would make the purchase of their new home possible, however, things go terribly wrong and he gets fired. Barely able to contain his anger, David then rushes into Linda's office and with a short but very passionate speech convinces her to quit her miserable job. A few days later the two sell all of their possessions, then combine their financial assets, buy a Winnebago and hit the road. For the first time in years David and Linda feel truly free and even blessed that they have been able to escape the corporate world. But when Linda foolishly loses all of their savings in a casino in Las Vegas, their American Dream very quickly evolves into an American Nightmare. 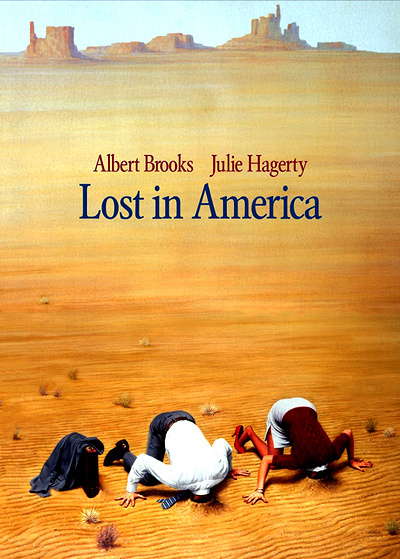 • Julie Hagerty - in this new video interview, actress Julie Hagerty discusses her contribution to Lost in America and discusses Albert Brooks' working methods. The interview was conducted exclusively for Criterion in 2017. In English, not subtitled. (12 min, 1080p). • "Albert First" - An Interview with Herb Nanas - in this new video interview, Herb Nanas, Albert Brooks' longtime manager, recalls his first encounter with the dierctor of Lost in America and discusses his unique style and career. The interview was conducted exclusively for Criterion in 2017. In English, not subtitled. (12 min, 1080p). • James L. Brooks - in this new video interview, James L. Brooks discusses his professional relationship with Albert Brooks and his working methods, some of the unique risks that make his films special, and the shooting of Lost in America. The interview was conducted exclusively for Criterion in 2017. In English, not subtitled. (15 min, 1080p). • Albert Brooks and Robert Weide - presented here is a brand new filmed conversation between Albert Brooks and filmmaker Robert Weide (How to Lose Friends & Alienate People). The bulk of the information addresses the actor/director's career in the film industry, his style (both in front and behind the camera), and the conception of Lost in America. The conversation was filmed exclusively for Criterion in 2017. In English, not subtitled. (31 min, 1080p). • Trailer - original trailer for Lost in America. In English, not subtitled. (3 min, 1080p).